Instead of creating seperate posts about the good things going down with Fun Fest this weekend, we’re just gonna give it all to ya at once. 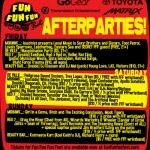 For a full list of after parties and oficial pre-festival shows, have a look at the fancy flier attached to this post. If you want some help making decisions, we’d recommend parking yourself at Mohawk Friday-Sunday night. The venue features Brothers & Sisters on Friday night, a White Denim CD release party Saturday night, and Girl in a Coma to close things out Sunday night. 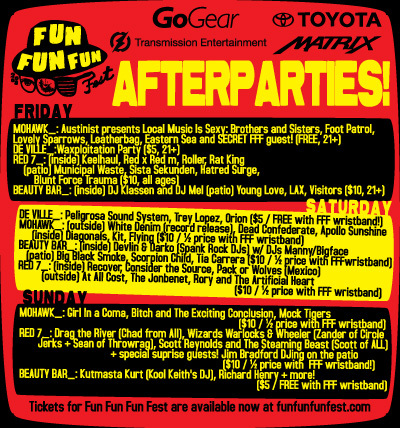 To make it even more enticing, every show is either free or half price with your Fun Fest wrist band. Some compelling stuff here. I’ll be sure to return. Thanks!